. . . And a Fundraiser! Pre-K- 3rd Grades Jog for 10 minutes. 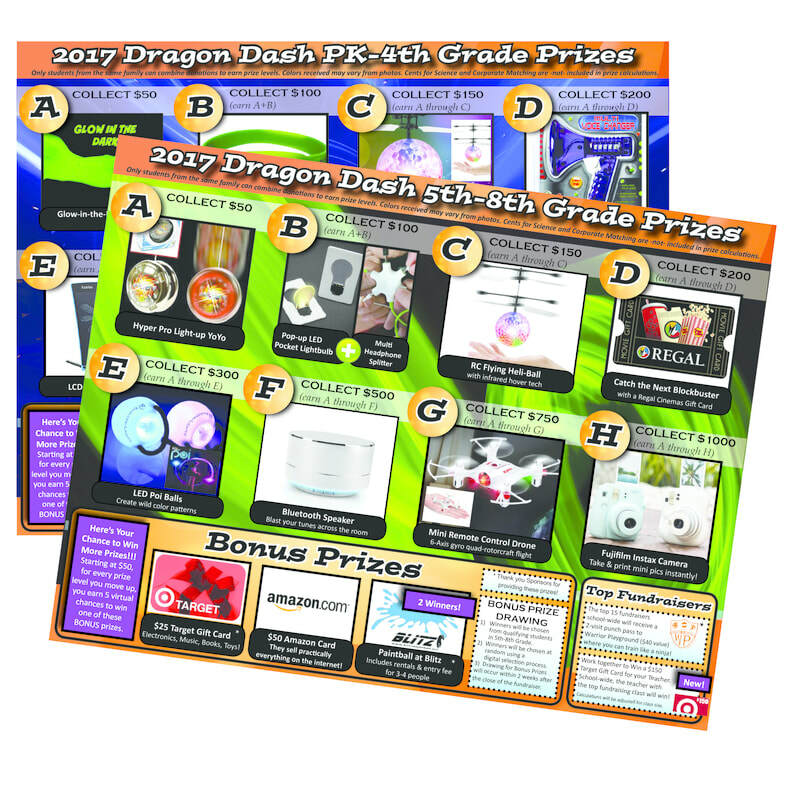 The fitness portion of Dragon Dash is an all-school event. 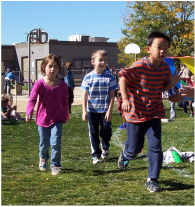 Like participating in P.E., students are encouraged to jog, run or walk, according to their abilities, even if they aren't collecting donations. Each student has a professional race bib with an integrated timing chip that registers how many times they run around the 1/10th mile track. You will be able to see your student's statistics right after they run to celebrate their success! All Pre-K and Kindergarten students who run in the Jog-a-thon will receive ribbons! We are encouraging our littlest Dragons to walk this year. The 1st, 2nd & 3rd place Girls and Boys in each Elementary class will be presented with a ribbon the day of Dragon Dash. The top three Girls and Boys in each Middle School grade will be presented with a ribbon. Jog-a-thon during their school day. Fundraising is voluntary. Students gather pledges Sept. 22nd - Oct. 18th. Most students collect flat donations, but "per lap" pledges are great too. All donations are tax deductible. Also, check with your employer for their "Corporate Match" program guidelines. Checks should be made to Flagstaff Academy PTO or donate here online. Continue fundraising even after the event. Our goal for 2017 is to reach $45,000 for Science, Technology, Art & Music equipment, special projects and school events! Students can talk to family and friends to collect donations for running. co-workers that make it real! The PTO accepts donations all year. & start your employer paperwork afterwards. Corporate Matches are not included in prize level calculations. Prizes are Awarded based on the level of donations collected.